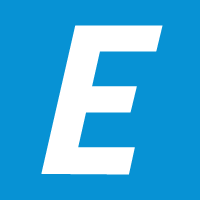 Today we are introducing Multi-Option Quotes in Edvisor.io. We've heard from many of our customers that it's painful and time consuming to issue different quotes for students interested in multiple schools and locations. Both the data-entry as well as the back-and-forth around which option is best for the student. This is why we built multi-option quotes: an easy way to let students understand and compare their options in different cities and schools. 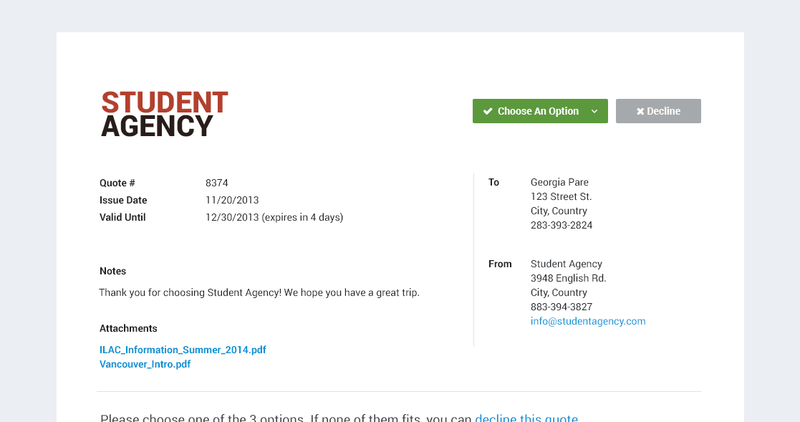 As an agency, you save time by creating fewer quotes and by reducing the back-and-forth conversations with students. Students can choose the option they like right on the quote! You can even include brochures and PDFs to give students more information. 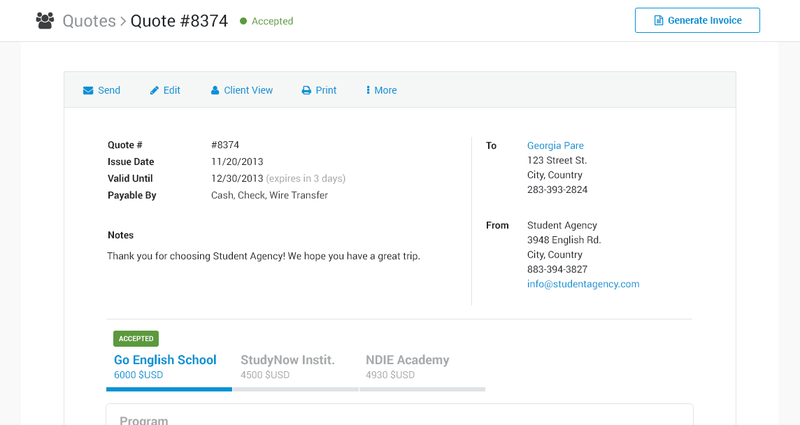 To top it off, Edvisor can automatically generate an invoice based on the option the student has chosen. Creating a quote takes three easy steps. Fill out the details for one study abroad option, duplicate and modify for additional options, attach custom notes, and send! Your student will then be able view the quote online, compare all of the options you've provided, and choose the one they would like. When they do, you'll be notified instantly so that you can follow up with them quickly. Once a student accepts a quote, you can automatically generate an invoice with all the information you need with a single click. No more need to copy student and program information a second time. You can now also add files and photos to the quotes and invoices that you issue. Whether a brochure of the school or city, a registration letter, or anything else you'd like to add, students can see everything together to make quicker and more informed decisions. Let us know if you have any questions, we are here to help! As always, keep sending us feedback and comments, we love hearing from you and it will shape Edvisor.io going forward!